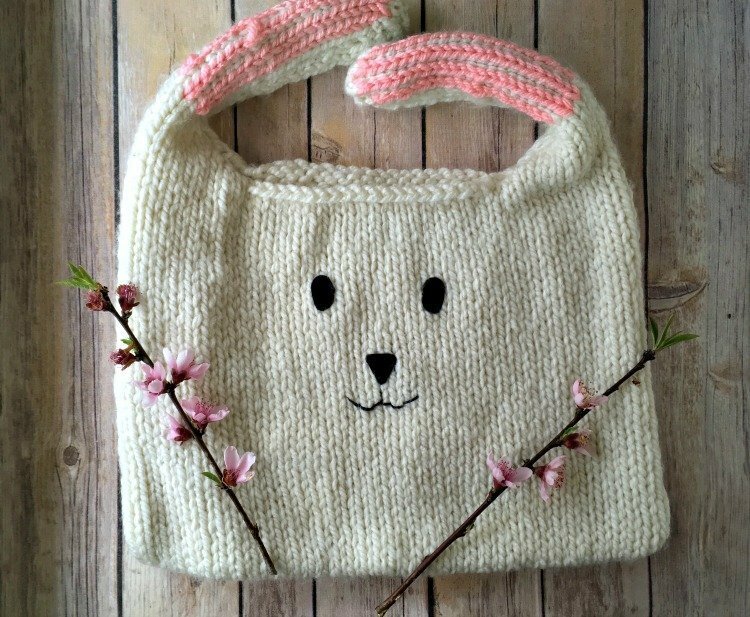 Floppy Bunny Bag - Free Knitting Pattern - love. life. yarn. Easter is almost here!! 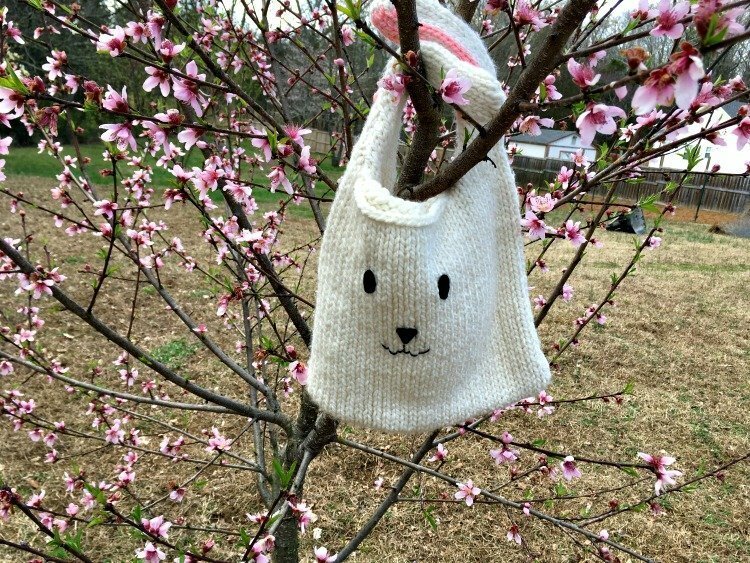 Head to your egg hunts in style with this adorable knit bunny bag. Worked in a chunky yarn so it knits up super quickly. The eyes and nose are made of felt and the mouth is embroidered. 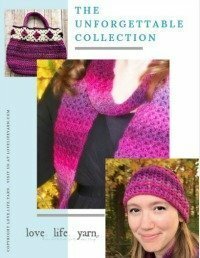 You can work the ears in duplicate stitch or intarsia – it is up to you! Yarn: Deborah Norville Serenity Chunky (100% Acrylic; 109 yards [100 meters]/100 grams): #700-21 Pristine (MC), 2 balls; #700-24 Lilac Chiffon (CC), 1 ball. Notions: Tapestry needle; black felt (about 4×4”); black scrap yarn; sewing needle. With MC, CO 42 sts. Rows 3-40: Rep Rows 1-2. Row 1: K12, BO18, k12. Row 2: Purl to last 2 sts, p2tog, join second ball of yarn at opposite ear, p2tog, purl to end – 11 sts per ear. Row 4: For first ear purl to last 2 sts, p2tog, for second ear p2tog, purl to end – 10 sts per ear. Row 6: Rep Row 4 – 9 sts per ear. Row 8: Rep Row 4 – 8 sts per ear. Rows 11-48: Rep Rows 9-10. Row 49: *K2tog, k4, k2tog; rep from * for other ear – 6 sts per ear. Row 51: *K2tog, k2, k2tog; rep from * for other ear – 4 sts per ear. Use duplicate stitch with CC for ears as shown in photo. Starting at inner edge of ear, sew around ear, sew sides and bottom, sew around second ear, leaving an opening between ears. Cut ovals for eyes out of black felt. Sew in place using photos as guide. Cut a nose from black felt. Sew in place using photos as guide. Use several strands of black embroidery thread to sew mouth.